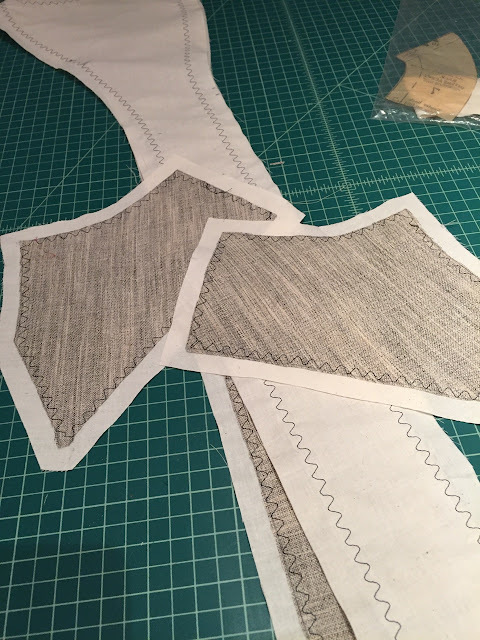 male pattern boldness: Sewing with the King! 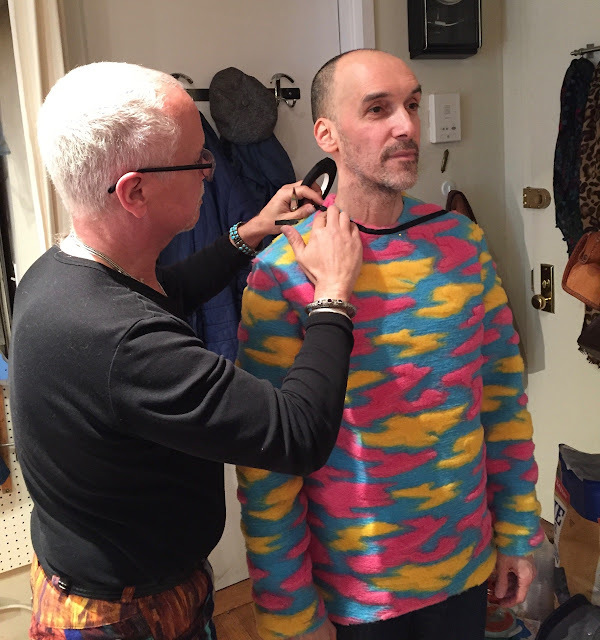 I participated in what Kenneth calls a "mini sit-and-sew" held in his Manhattan studio, just a stone's throw from Union Square. Sit-and sew sessions are limited to just two people and you work on whatever project (or projects) you choose. You get as much input and guidance from Kenneth as you need, whether it's related to fitting, pattern drafting, sewing techniques -- you name it. The experience was inspiring and so much fun. Outside of a traditional classroom setting, I'd never sewn with anyone before. 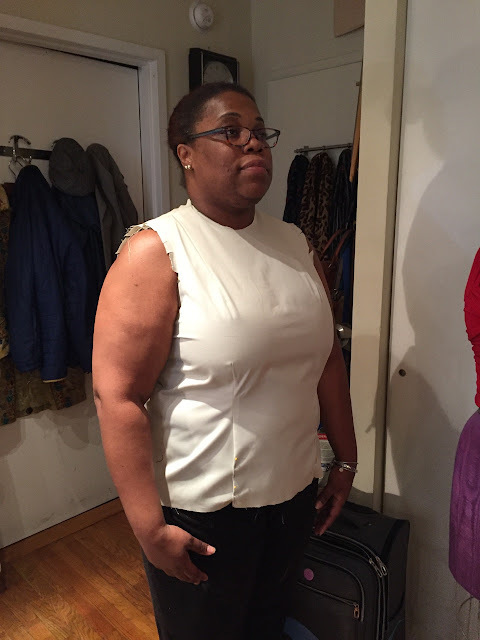 One project I worked on was a sloper I'm drafting for my client Kelli using Kenneth's moulage method. I'd done quite well on my own but Kenneth helped me see where I could make additional tweaks to improve the fit. A challenge I sometimes have is to transfer sloper adjustments to the paper pattern accurately. It was great having Kenneth right there to show me exactly how to do this. Kenneth also brainstormed with me about how I might finish the wacky knit sweater I started last week. 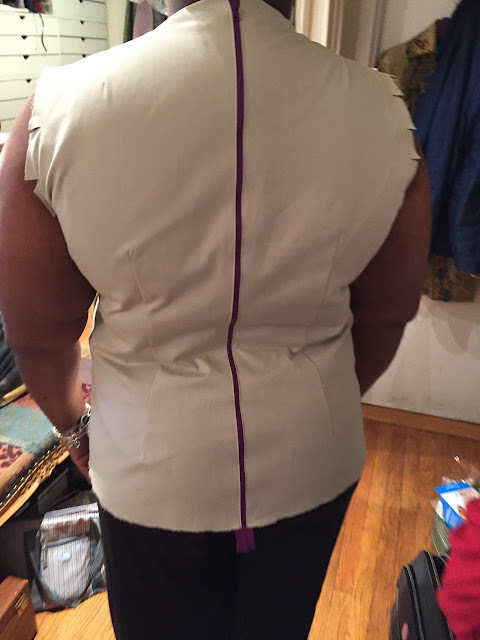 We tested a few neckline possibilities and found one that really looked cool. Stay tuned! 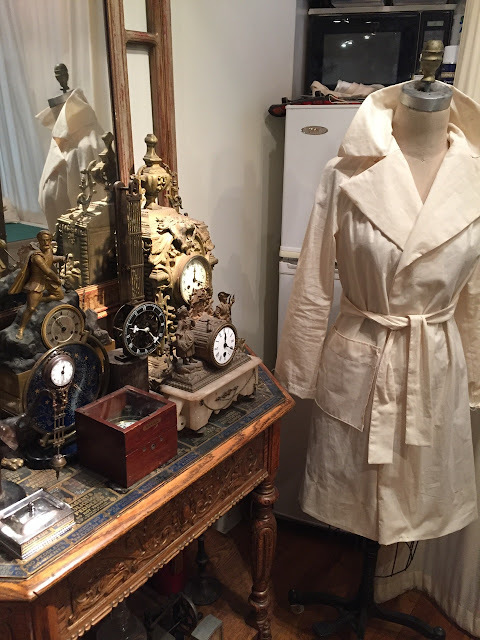 Finally, Kenneth helped me come up with an ideal method to add support to the facings in Leah's coat, since the nylon taffeta fabric by itself is rather flimsy. I was thinking fusibles, but Kenneth talked me out of it: they wouldn't stay fused past the first dry cleaning, in his opinion. He suggested using a combination of hair canvas and cotton muslin stitched together. 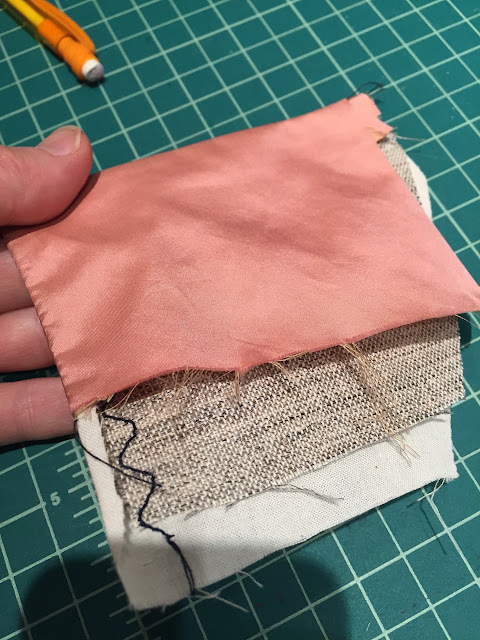 The two layers (canvas and muslin) are attached using a serpentine stitch just inside the stitch line. The canvas is then trimmed up to the stitch line so that only the muslin gets attached to the outer fashion fabric. I'll use this canvas/cotton combo in the facings as well as the upper and lower collars. Apart from all the excellent guidance I received, I also got to sew on Kenneth's marvelous Bernina sewing machines -- a treat. But best of all, perhaps, was just getting to talk sewing (and life) with a true master. You can find dates for future mini sit-and-sews, as well as contact information, on the event page of Kenneth's website here. 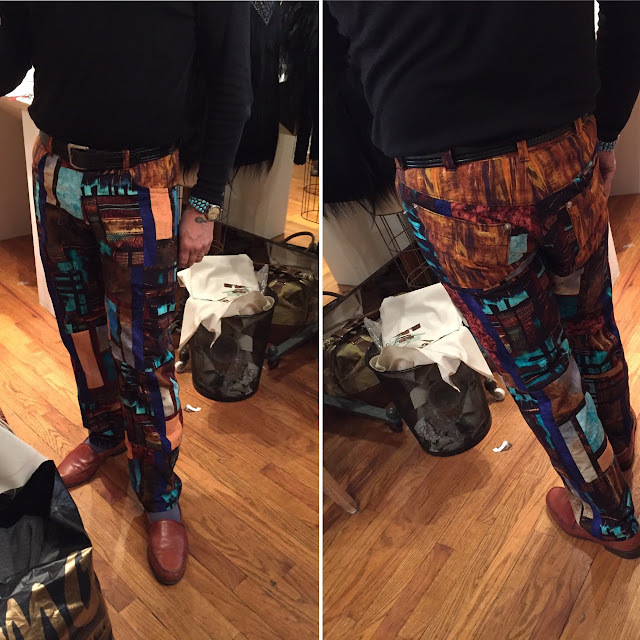 An unexpected treat was getting to see Kenneth's fabulous new pants, hot off the sewing table! Peter, I have enjoyed group hands-on and lecture format weekend events with KDK (at Janie's Sewing Corner - now sadly closed, as she retired). I am guessing maybe over the last 4 or 5 yrs once a summer. Always a blast... and inspiring and genuinely high-value learning. His generosity with the 'home sewer' is amazing and I have been blessed. The two day Moulage class was mentally exhausting but so worth it. You leave me once again wishing I had the experience of big city life in NYC to do what you are doing: F.I.T. classes and the sit & sew with KDK. If by some chance you have not read his book, All Grown Up Now: A Friendship in Three Acts it is time to do so. Thank you for your generous sharing as well! oh he is fantastic! I took a pants sloper class with him. He is such a patient generous teacher. What a great opportunity. I would have loved to have been a fly on the wall, listening to you two! I've read that he's charming, very down-to-earth -- the best kind of famous person. And those pants are incredible. I am far beyond jealous! That would've been so incredible. I hope we get to see some finished garments for Kelly. I bet you give her fit she has craved for a long time! I enrolled in most of Kenneth D King's classes on Craftsy: Jean-ius, The Carefree Fly Front Coat and Designing Details, Pockets. I've not gone through the pockets class yet but the other two are wonderful. You are so lucky to be able to sew with him. By the way, I read "All Grown Up Now" and it is a very good book. How fun! And I love that idea about the muslin and hair canvas - very clever! It's always a treat to spend time with Kenneth. I took his moulage 3-day seminar and met him several times after at ASDP functions - he was our Lifetime Achievement Award winner in 2013. That muslin-edged canvas interfacing method is wonderful - I learned it from Kenneth in a jacket seminar here in Massachusetts at least 10 years ago. The jacket I made in that class is still beautifully supported, through many wearings and cleanings. So glad you had the chance to sew with him! You've sewn on another man's machine, a Bernina no less (BERNINA! ), and that man is the maestro, Senor King (his samba hips were made for those pants and that pattern). You are the James Lipton of Sewing, he who transcended the looking glass, a man with a life not charmed, but anointed. Bear witness to one man's journey into the King's lair, with subsidiary gains for an actress unaware, and a neckline shape which isn't yet clear; such things can only happen where Dr. Seuss meets Rod Sterling, in, the Lappin Zone. Great input. I love everything about Kenneth and you. Accomplished sewists are so willing to share. I had the luck to take a short (4hr? 2hr? It went by in a blink) tips class with him at the the ASG Sewing Expo in Novi, MI two years ago. The most amazing class ever!! I only wish I lived closer to NY (or that they'd have him back to the Expo). Some day I'll be able to take classes with him again. He's just a font of information and so easy to talk to. And, when I made a mistake on my test item (using a similar technique to the underlining/interfacing he suggested to you). I didn't feel like ripping it apart since most of the sample was good and I had more stuff to work on. So I just picked up my pen to note on the muslin what I did wrong; not realizing he was standing right behind me. He agreed that was a good idea to do--no bothers to make the sample "right" as long as I knew what it was supposed to be. What a treat that is to sew with KK. I have his books including All Grown Up. Glad you shared with us this experience. 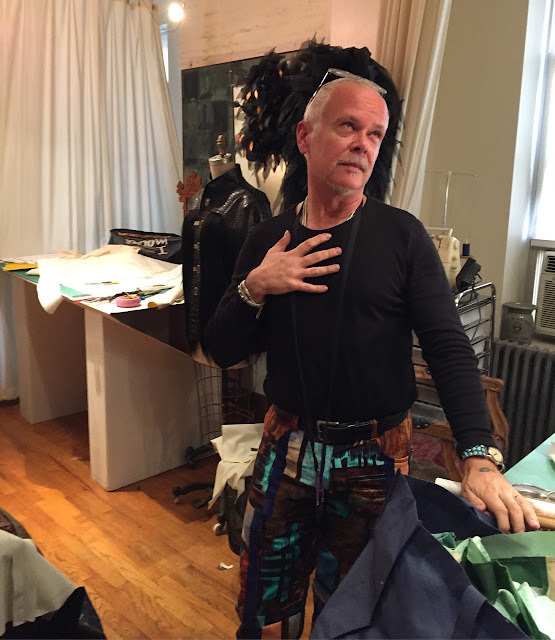 Only in my dreams, could I imagine such an amazing experience as to sew with Kenneth King. I have taken his Craftsy classes, and learned so much. So happy for you! Our loss in SF has been your gain in NY. I was able to take several classes taught by Kenneth while he was still a fledgling instructor at La Canada College in Redwood City. He is a delightful teacher! Love his stories. I'm so happy for Kenneth and his husband too. I hope you're able to sew more often with him. Sewing with the King! That might just beat playing the guitar with BB King. I've taken 2 of his Craftsy classes and just love his methods of teaching. Happy to hear he sews with a Bernina - my favourite. There's no chance I will ever be able to do a sit and sew with Kenneth as I'm in Canada on the Left Coast. Thanks for sharing a dream come true! I would so love to be able to have a few days with the King. I was emailing him this weekend, using his moulage CD book. He's absolutely brilliant. Thanks for sharing this experience. It's uplifting to learn of people sewing together and having a great time! I am pea green with envy! My imaginary perfect date would be a sit and sew with the both of you!